I first met Syrie at the AGM in Fort Worth [along with her very own Mr. Darcy! ], an honor for me as I had dearly loved The Memoirs of Jane Austen – I thought she captured very well the life and voice of Austen and her time. In The Missing Manuscript of Jane Austen, she takes us again into this Austen world, offering up the most intriguing tale and what we all wish for: a missing manuscript, missing letters, missing anything from our favorite illusive author. And in Missing Manuscript, we have two books for the price of one – a delightful tale within a tale that gives us a lost Austen novel titled The Stanhopes, based in part on Austen’s own “Plan of a Novel” *, and the contemporary tale of the young woman who discovers the letter that leads her to the manuscript. I loved this book! – Syrie has given us a story that would make Jane Austen proud and a fine taste of what such a real find might offer us (with of course the caveat that no one is really like Jane Austen…) [An Interesting Aside: I have been reading Trollope’s Barchester Towers, wherein we have a story of a vicar who is suffering from the loss of his parish, as well as a family named the Stanhopes! I asked Syrie if she had any of this in her mind when she was writing – she said she has never read any Trollope and had no idea! Another example of the “collective unconscious” at work in mysterious ways! – and I struggling to keep my Stanhopes straight!] So I highly recommend this book – a perfect winter read to curl up with – you will find endearing characters, sly allusions to Austen’s life and works that make this a bit of a treasure hunt, two love stories (who can resist! ), and storytelling at its best. 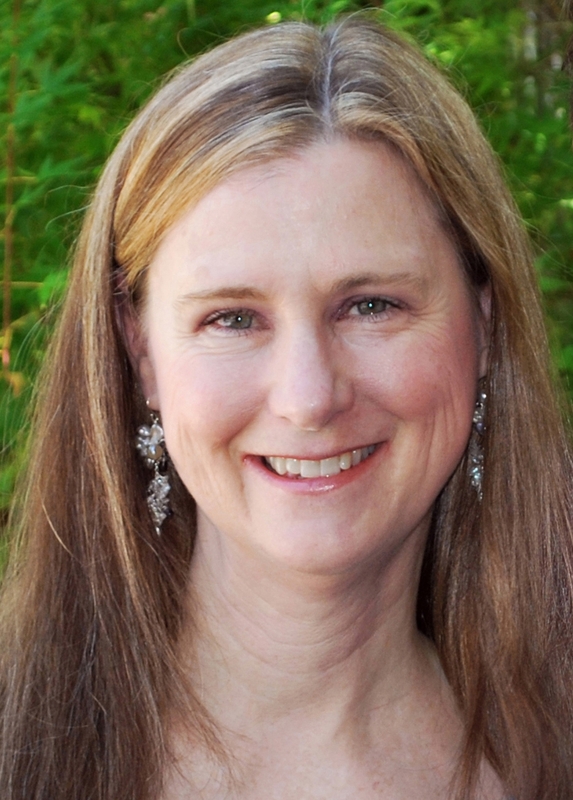 So please welcome Syrie as she discusses how important the Jane Austen Society of North America [JASNA: www.jasna.org] is to her and how it has helped her writing career. JASNA has become such an important part of my life. Interestingly, I hadn’t even heard of the organization until The Lost Memoirs of Jane Austen came out. Following a suggestion from my readers, I checked it out and discovered that a spring meeting of JASNA-SW (my local Southwest chapter) was being held at the UCLA faculty club, which isn’t far from where I live. I signed up to go, having no idea what to expect. I arrived at the luncheon not knowing a soul—and to my surprise and delight found I was surrounded by remarkable, like-minded people from all different professions, all bound together by their love of literature in general and Jane Austen’s works in particular. Many of them had already read my novel. Talk about finding “my people”! The agenda was packed with interesting speakers and included an activity that to me was to die for: an excursion to the UCLA research library where we were allowed to view a first edition of Pride and Prejudice. I was hooked for life. I attended my first JASNA AGM (Annual General Meeting) that fall in Chicago. An AGM is truly Jane Austen Heaven, with an emporium selling Austen-related goodies, and four days of sessions, speakers, special interest activities, dance lessons, and entertainment all related in some way to the Regency era or Austen’s books, culminating with a Regency Ball where everyone dresses in period attire. Since then, my husband and I have attended nearly every AGM (we plan our vacation schedules around wherever the next conference happens to be). Some attendees dress in period attire, and since I like to sew and love costumes, it’s a treat to have an excuse to don a Regency gown and bonnet! The organization has been a tremendous help to my writing. I learn so much at the breakout sessions, both at the AGMs and local chapter meetings. 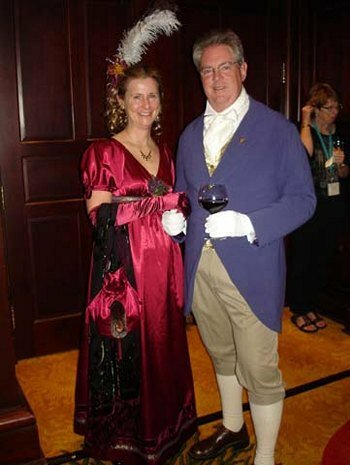 Just as one example, at the AGM in Fort Worth in 2011, there was a session on transportation in the Regency era. I learned about the types of carriages used, how the system of changing horses worked throughout England, and how long such trips might take—all of which enhanced my own research and was valuable when I wrote the traveling scenes in The Missing Manuscript of Jane Austen. JASNA has also been a wonderful boon to my career. My local chapter is very supportive of my work, inviting me to do readings from my books (attendance at the meetings ranges from 65-160 people) and arranging for me to sign books at their booth at the annual L.A. Times Festival of Books. I’ve made so many friends through JASNA—many of whom live in far flung states and in England, Canada, and Australia—who I look forward to seeing once a year at the AGM. I was the keynote speaker for a JASNA Boise Idaho’s Jane Austen tea, which made for a delightful wintry trip and forged lifelong friendships. The book launch and signing for Jane Austen Made Me Do It, an anthology edited by Laurel Ann Nattress to which I contributed an Austen-themed short story, was held at the 2011 AGM (and was great fun). At the meeting in Brooklyn last October, fellow author Diana Birchall and I co-wrote and presented a comedic play “The Austen Assizes” which was voted the #1 breakout session of the entire conference. (Highlights reel here). The committee hosting the Montreal AGM in 2014 recently commissioned us to write an original play for the plenary audience, and we couldn’t be more delighted. Diana and I have performed her comedic two-woman play “You Are Passionate, Jane” (where Jane Austen and Charlotte Brontë meet in heaven) for two JASNA chapters (highlights video here)—fulfilling my dream to play Jane Austen on stage! As you can see, I can’t stop talking (or writing) about JASNA! For anyone who enjoys Austen’s works, I highly recommend that you join! Gala Online Launch Party at austenprose.com! Giveaway of The Missing Manuscript of Jane Austen! 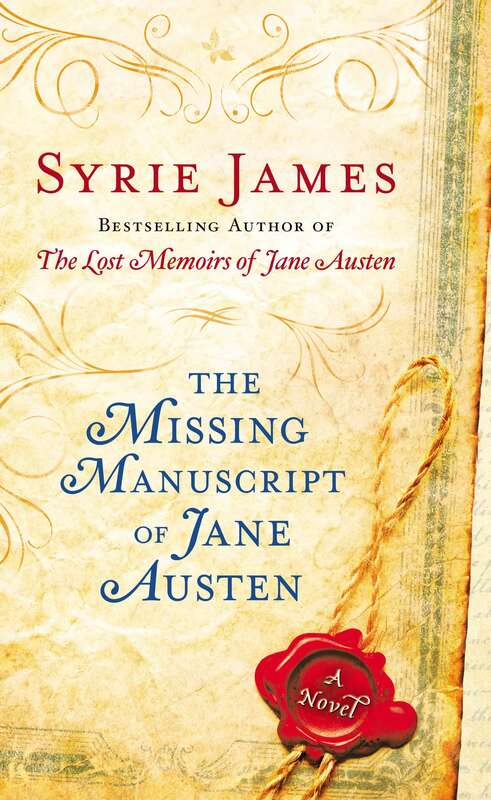 please either ask Syrie a question or comment on your favorite Syrie James book (and why) to be entered into the random drawing for a copy of The Missing Manuscript – worldwide eligibility. Deadline: Monday January 21, 2013 11:59 pm – winner will be announced on Tuesday January 22nd. Thank you all, and Thank You Syrie for posting here today! This entry was posted in Author Interviews, Book reviews, Jane Austen, Jane Austen Popular Culture, Jane Austen Sequels, Jane Austen Societies, JASNA, Regency England and tagged Historical Fiction, Jane Austen, syrie james, The Missing Manuscript of Jane Austen. Bookmark the permalink. I especially loved the Southampton part of “The Lost Memoirs of Jane Austen”. It is the only one I have read so far. I look forward to trying more in the future. Cheers! latest! Thank you for the giveaway. Great post on JASNA, Syrie. How I wish there is a Jane Austen Society in my country, Malaysia, for me to join. Anyway, I want to ask are there any more Jane Austen-related novels in the works, Syrie? Hi Luthien! I do indeed have another Jane Austen-related novel in mind, which I hope will be my next novel to succeed “The Missing Manuscript of Jane Austen”! Keep watching my website, http://www.syriejames.com, and I’ll post more information when it becomes available. I’ve known about your first Austen novel for awhile by seeing it in my local Barnes and Noble. What I can’t work out is that you’d never heard of JASNA. Had you seen other JAFF out already when you decided to write that book? I’ll certainly be reading this new book of yours! I’d very much like to win a copy! My favorite book is The Missing Manuscript of Jane Austen. I loved the novel within a novel approach, and thought The Stanhopes was great. I also enjoyed the appearance of Mary I. Jesse. Thanks, Melissa! I’m so glad you loved the book. I had a great time writing it! You’ve studied so much of Jane Austen’s life. Of all her novels and stories, which do you think was her *least* favorite story or heroine or hero? (I’m pretty sure that Lizzy and Darcy were her favorites!) Thank you. I can’t believe I have not read anything by Syrie James yet. I love everything Jane Austen inspired. I know I will not be disappointed. I have read your first Jane Austen related book, I will definitely read this new one and I am delighted to hear that there will be a third! I also love books about Jane Austen’s life and works. You must have read a lot for your research. Which books would you recommend? Hi! In all the research you have done about Jane Austen and her time, what has surprised you the most? Thanks! Nice costumes. How did you decide on your costume? Thanks for the info about JASNA! I have heard of them, and now want to know more. I also want to ask a question of Syrie: what was your first introduction to Jane Austen, & was it love at first sight?